Purpose: To describe a modified stop and chop technique for managing soft cataract to improve the surgical safety. 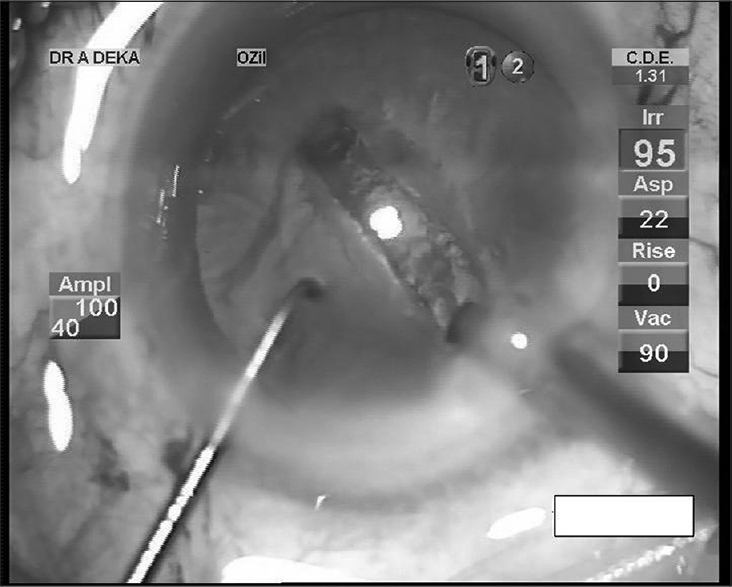 Materials and Methods: Capsulorrhexis is performed as usual with a 27-gauge needle. A trench is fashioned using low ultrasonic power. 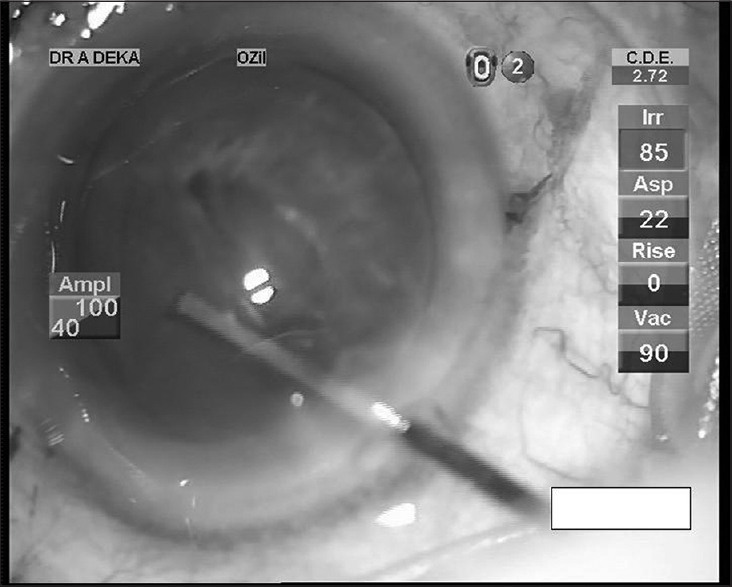 Hydrodelineation is performed by a cannula introducing directly in central lens substance. Hydrodissection follows next, and precise hydroprocedure is achieved. Nucleus is emulsified using ultrasound power, and intraocular lens is implanted. Results: This technique results in easy rotation and removal of nucleus and epinucleus using low phaco power. 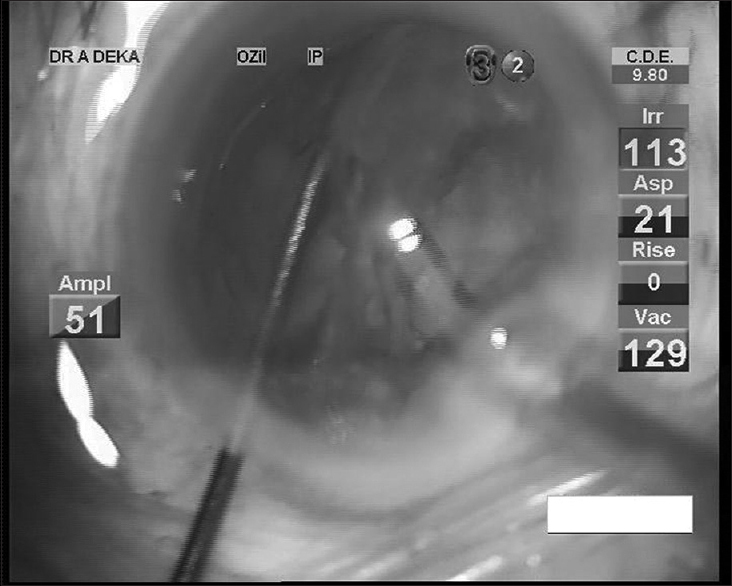 Conclusions: This modified phacoemulsification technique is safe and very effective to emulsify soft to moderate hard cataract where direct chop is not possible. A meticulous preoperative evaluation is performed before scheduling phacoemulsification. Surgeries are performed under topical anesthesia. A 2.2 mm corneal incision is made. After continuous curvilinear capsulorrhexis, a central trench is sculpted extending from one edge of capsulorrhexis to the other edge [Figure 1]. Low phaco parameters are used [Table 1]. The depth of the trench is about 70% of the total lenticular thickness. Delineation is performed by rapid injection of a balanced salt solution into the central lens substance using a 29 gauge cannula [Figure 2]. A golden ring within the lens is confirmation of successful delineation. Once hydrodelineation is completed, cannula is penetrated between anterior capsule and cortex to perform hydrodissection [Figure 3]. In cases of posterior subcapsular cataract (PSC), central soft nucleus is emulsified with low ultrasonic power [Figure 4]. 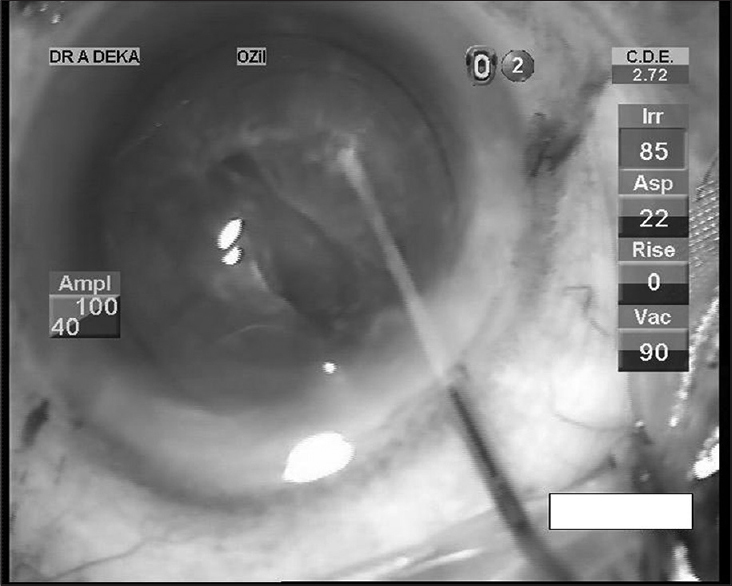 In NS2 cataract with PSC, nucleus was emulsified using stop and chop technique. As the nucleus collapses during hydrodelineation due to central trench, the nuclear rotation is easier and phacoemulsification is safer. Epinucleus and cortex are aspirated out, and intraocular lens is implanted. Chylack LT Jr., Wolfe JK, Singer DM, Leske MC, Bullimore MA, Bailey IL, et al. The lens opacities classification system III. The longitudinal study of cataract study group. Arch Ophthalmol 1993;111:831-6. Braga-Mele R, Khan BU. Hydro-chop technique for soft lenses. J Cataract Refract Surg 2006;32:18-20. Fine IH. The chip and flip phacoemulsification technique. J Cataract Refract Surg 1991;17:366-71. Güell JL, Vázquez M, Lucena J, Velasco F, Manero F. Phaco rolling technique. J Cataract Refract Surg 2004;30:2043-5. Vasavada AR, Raj SM. Inside-out delineation. J Cataract Refract Surg 2004;30:1167-9.